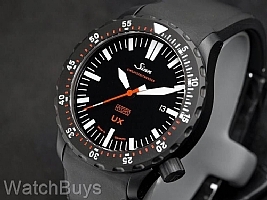 The Sinn UX Black is constructed from the same steel that is used on the outer hull of submarines. The steel was procured by Sinn from a steel supplier to Emden GmbH, one of Germany's North Sea shipbuilding yards who construct submarines from the very same steel. Next, the Sinn UX Black features a completely Tegimented case, bezel, crown and case back. Standard steel used by most watch companies has a hardness of between 200 and 240 HV (Hardness Vickers is a common scale used to measure material hardness). Unlike the Sinn U1 and Sinn U2, the Sinn UX Black features a quartz movement rather than a mechanical movement. The Sinn UX Black is covered with a thick sapphire crystal for extreme protection. This sapphire crystal features a special anti-reflective coating that is scratch resistant - the coating itself has been hardened to 1,800 HV. This watch is designed for operation in extreme temperature variations - it operates in temperatures between -20 Celsius to +60 Celsius. Verified Owner Comments: Leave it to Sinn to create such an amazing quartz watch! Great presence on the wrist but not overly bulky or heavy. Stealthy but standout appearance, great accuracy and really cool technology with the oil-filled case. I really appreciate the increased all-angle legibility! Verified Owner Comments: Absolutely the best quartz watch (COSC Certified) on the market. A great combination of technology and ruggedness. Verified Owner Comments: Built like a tank, not too thick or heavy, readable at almost any angle, super accurate. Definitely a keeper, if you want a quartz this is it!